Rep. Adam Greshin (I-Warren) speaks in favor of freezing an energy-efficiency charge that Vermont electric customers pay in a House Ways and Means Committee hearing Wednesday. Discontent over Efficiency Vermont’s ever-growing budget boiled over Wednesday in the Statehouse. A key House committee voted for a two-year freeze on an electricity fee that funds the energy-efficiency program. The House Ways and Means Committee, on which Greshin serves, voted 8-2 on Wednesday to keep the energy efficiency charge that Vermonters pay on their electric bills at its current rates until 2018. The rate is set by the state Public Service Board, but Greshin successfully amended a larger renewable energy bill to mandate the freeze. For residential customers, this year's fee is $0.01173 per kilowatt hour. This month, Greshin said, that came to about $9.50 cents on his $119 Green Mountain Power Corp. home electric bill. What was remarkable about Wednesday’s move was that it won the backing of a number of longtime energy-efficiency supporters. The House Natural Resources and Energy Committee voted 7-1 to endorse the rate freeze. Rep. Tony Klein (D-East Montpelier), who chairs the committee, said he thinks Efficiency Vermont has done an insufficient job of proving its worth to Vermonters. “I just challenge Efficiency Vermont to change our minds, to change Vermonters’ minds,” he said. Klein said he also agreed to the amendment in hopes of winning tri-partisan support for the overall renewable energy bill, known as RESET. 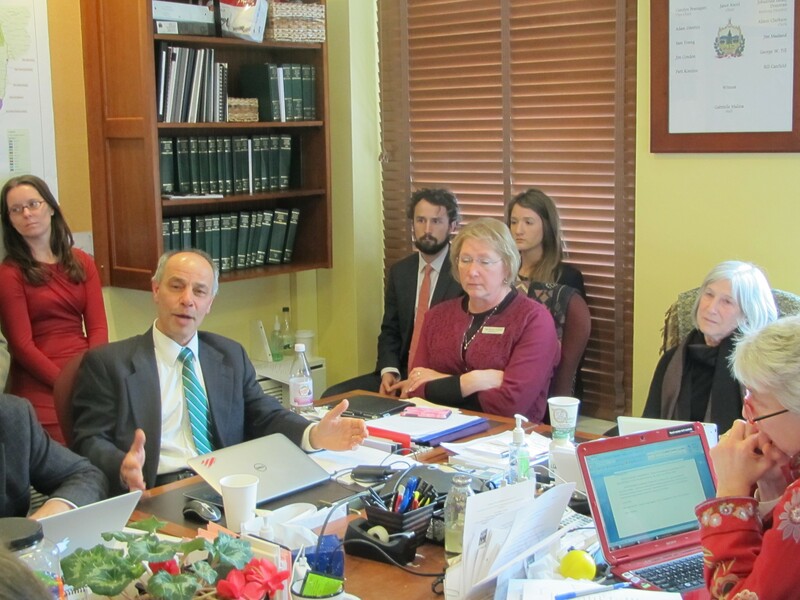 Efficiency Vermont, a state contracted program run by the Vermont Energy Investment Corporation, has long been a golden child of the legislature’s Democratic majority. Supporters laud the program — which coordinates and offers incentives for energy-efficiency projects — for cutting Vermonters' energy consumption and limiting the need to expand the state's electric capacity. Department of Public Service Deputy Commissioner Darren Springer came to the program’s defense Wednesday. Reducing the fee will cut Efficiency Vermont’s budget by $10 million over three years, he said, but cost $20 million to $24 million in savings over 10 years. George Twigg, director of public affairs at VEIC, joined in the program’s defense. The price for a kilowatt of energy not used is 4 cents, he said, while buying that same kilowatt on the open market would cost about 8 cents. Greshin and others argued that the program has had too little oversight. Rep. Patti Komline (R-Dorset) asked whether Efficiency Vermont could find efficiencies in its own operations to cover the rate freeze, as other state agencies will be expected to do this year. Efficiency Vermont operates pretty efficiently, Twigg responded. The program's budget was $14 million in 2003, Greshin noted. By 2015, it had grown to $52.2 million. In 2016, without the freeze, the program was slated to receive $54 million. The fee charged on residential electric customers’ bills was $0.00317 in 2003. This year, it is $0.01179. All that money has done some good work, Greshin said, including at Sugarbush Resort, the energy-intensive ski area he co-owns. Under state law, Efficiency Vermont is required to show that for every $1 spent, $2 is saved. Greshin argued that many programs and services, including pre-kindergarten, have similar returns but don’t get the same level of state support each year.